In celebration of its 150th anniversary this year, Zenith started rolling out some commemorative pieces, like the Christophe Colomb Hurricane Grand Voyage II, late last year. This 10-piece limited edition comprises many of the artistic crafts for which Zenith is known, including engraving and micropainting. And the brand’s unique expression of fine watchmaking is evidenced by its patented gravity control system, fusée-chain transmission, and a frequency of 36,000 vibrations/hour. 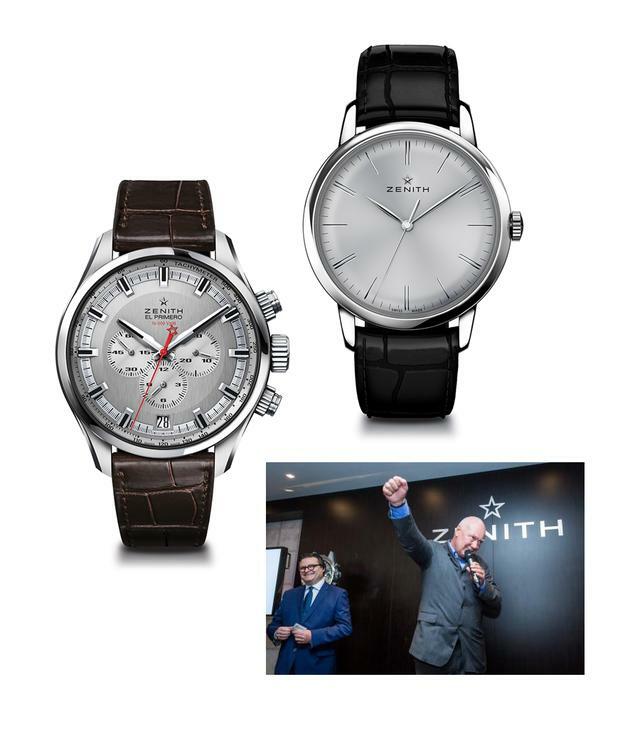 On Wednesday, Jean-Claude Biver, president of the LVMH Watch Division, and Aldo Magada, CEO and president of the brand, kicked off the 150th anniversary celebrations at BaselWorld 2015 and introduced a new book written by watch collector Joël Duval. The 400-page tome, available March 26, tells the colorful story of Zenith and includes 650 illustrations, most of which have never been seen before. New products making their debut at Baselworld include the Elite 6150 caliber and a watch model of the same name. The 42mm ultra-slim case will become a new benchmark size for the brand. The El Primero Sport collection is welcoming a new chronograph, with three variations and more to follow. The 45mm steel watch—on a leather strap, rubber strap or steel bracelet—is powered by the El Primero 400 B with an integrated column-wheel construction. There will no doubt be more products introduced to commemorate this momentous anniversary, including a new ladies collection. Rest assured that the Le Locle manufactory is already on it with the same zeal and quest for excellence that has kept Zenith at the forefront for the past 150 years.